The Big Guy and I recently celebrated a wedding anniversary. We don’t tend to trumpet this news – it’s about us, and we usually keep it between us. But the children are old enough to understand this milestone, apparently. The conversation came up with my Mother as to any possible plans we might have as she was pulling out of our driveway. When she was safely off the property, Second Born Son’s head spun around. “Why didn’t you TELL me it was your anniversary?! ?” he demanded. “Uh, I dunno, I didn’t think it was anything to worry about,” I replied. I recounted this tale to my Mother, and First Born Son was within earshot. “Oh MAN, it’s your anniversary? You should have said SOMETHING!” he said with great urgency. “I don’t look at THAT!” he replied. I resisted the impulse to state his father ignores the calendar too. The conversation continued and within this context, it came to mind that there was a reason why my kids reacted so strongly. While my Little Sister and I rarely if ever acknowledged our parent’s anniversary (until it came to milestones much later on), for my kids, parents who mark anniversaries are rare. As a matter of fact, just the day before we found out that another couple “bit the dust” – two kids now live a life with two households. For me, it’s not a biggie. For my kids, it shows them that their parents are becoming part of a minority – and their lives can continue with some level of “Normal”; even though the new “Normal” for their peers is drastically different. I shared my revelation with The Big Guy and he agrees. Perhaps we need to review our stand on anniversaries and make it something to celebrate as a family! 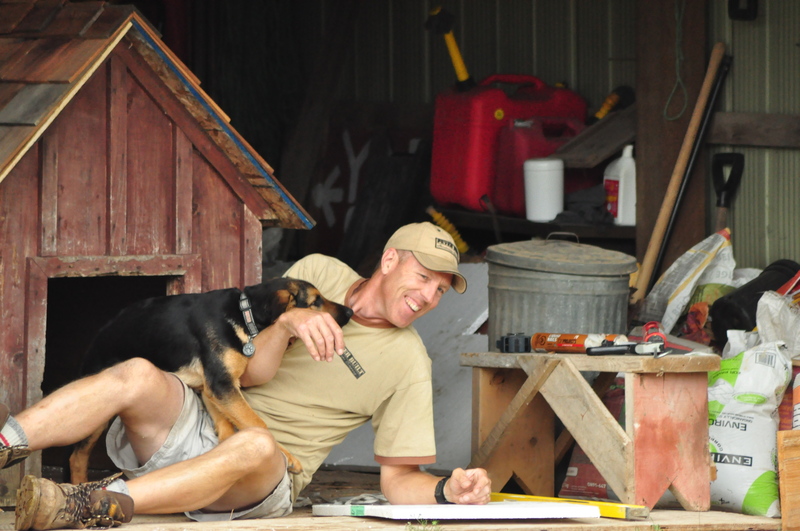 How we actually celebrated our anniversary…..me with a camera, he with a project outside with the pup….. Feel free to laugh at will. These are The Big Guy’s legs. Note the work boots – safety first people!! 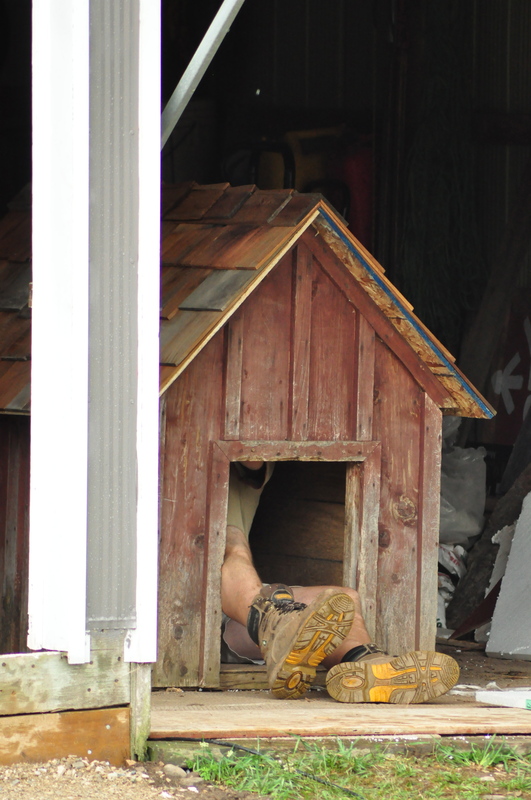 Yes, he’s in the Dog House. He’s actually repairing it so Roman can have a warm, dry place to sleep while we are away. Right now he is measuring for some insulation he wants to install. Here he is trying to get out – Roman has found him and wants to play. See the size of the knife in his hand? It’s a carving knife, lifted from the kitchen years ago – another beef for another column….. Roman is very keen and wants to help but fails to possess the opposable thumbs required. The Big Guy goes back in, and Roman thinks he should be able to as well. Persistence pays off. Roman is ready to launch! Tee hee – sorry, that’s all I’ve got for this one – hahahaha! Whew – it’s still “fun” at this point! 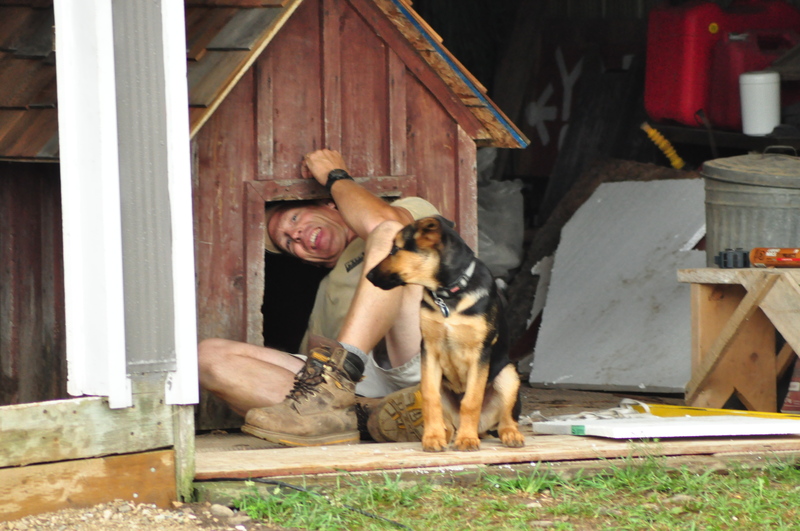 That was one full dog house. …and Roman knows as long as The Big Guy is smiling, it’s PLAYTIME!!! Out comes the knife again! Roman looks worried and wants to get back to the playing.